I’ve used that famous quote by George Burns countless times. Admittedly, I don’t remember when I first heard the phrase, but I do recall that when I heard it, I knew exactly what Burns meant: If you can make a career out of doing what you love to do, you’ll never work a day in your life. That message put into words everything I wanted to teach my nutrition students, which is why the quote was the first thing they saw on the blackboard when they entered my classroom to begin a new semester at the University of Oklahoma. Unfortunately, I never met George Burns. 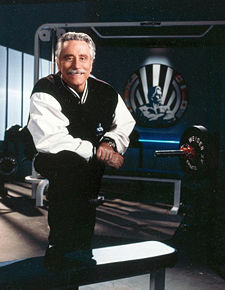 I have, however, had the blessed opportunity to become close friends with the founder of this magazine and the man who spawned an entire industry – Joe Weider. In a lunch visit with him this week (Wednesday, December 31st), I found myself again reminded of this classic quote and why I have so much admiration for Joe. He’s never stopped working tirelessly as a champion for the lifestyle that he fell in love with so many years ago. As part of our 70th Anniversary issue, slated for the May 2009 issue, I took Jon Finkel, one of our Staff Writers, to the modest-sized residence that Joe and Betty have called home for decades. Seriously, if you were driving through the Beverly Hills area looking for homes of the rich and famous, you’d pass the Weider’s by. In a land defined by conspicuous consumption, it’s refreshing to see that Joe bought a home, loved it, and decided to stay there. Don’t get me wrong, he has a beautiful house, it’s just not an extravagant or a material attempt to prove one’s worth via quantity over quality. Ironic, some may say, for a guy known as the ‘Father of Modern Bodybuilding.’ For those that know him, however, the home is pure Joe – aesthetics over size. Unlike Jon, I’ve had several meetings at Joe’s house; always the same locale – his back patio dining table. Before Joe came out to meet us, I was immediately reminded of his never-ending passion for keeping abreast of everything specific to our fitness lifestyle. Next to the outside patio table rests the familiar site of a rolling tray table, three levels high, with stacks of current peer-reviewed journals, fitness books, magazines, papers and clippings stacked across its top; a moisture-resistant tarp sits atop the collection to ensure that Joe’s pen (not the elements) is what provides the wear and tear of time on the Weider porch. While Jon and I were taking it all in, Joe exited the back door wearing his vintage huge smile. He offered us a gracious welcome and a firm handshake. The “meeting” was on. Our purpose for this visit was to ask Joe some questions about change; having been the impetus behind such radical change and having experienced much of it himself, who better to ask than Joe about what may lay ahead as Muscle & Fitness and Muscle & Fitness Hers changes leadership and refocuses direction? In other words, having been asked to return to Weider Publications, this time as Editor-in-Chief, I wanted to make certain that the vision and direction I’ve laid out serves the best interests of you, our reader, while also continuing down the path that Joe initiated nearly 70 years ago. As Jon learned firsthand, that path, which every issue of Muscle & Fitness marks like a timeline, represents the expansion of the original vision that Joe has had as a pioneer of fitness and bodybuilding throughout his lifetime. To Joe, however, bodybuilding comes in many forms and isn’t just the competitive sport as its come to be known; instead, he simply believes that one cannot truly be physically fit without possessing muscle.